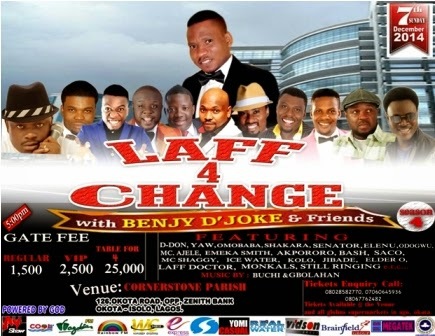 Nigerian versatile Gospel comedian, BENJY D' JOKE is set to host his annual comedy show ''LAFF 4 CHANGE with BENJY D' JOKE and Friends'' on Sunday 7th December 2014 at RCCG Cornerstone Parish, Okota, Isolo by 5pm. The event parades high ranking comedians like, D-Don, Yaw, Omobaba, MC Shakara, Senator,Elenu, Odogwu, MC Ajele, Emeka Smith, Akpororo, Bash, Saco,MC Shaggy, Ice Water, Kolo, Jibade, Elder O, Laff doctor, Monkals and still Ringing. A release from the event managers TWC Media listed Nigerian Gospel Reggae Minister Buchi, Gbolahan, PITA and Minister Sam as the Guest ministers. LAFF 4 CHANGE has been consistence with great feedback from the fans. Season 3 was headlined by the Nigerian comedy legend Alibaba.